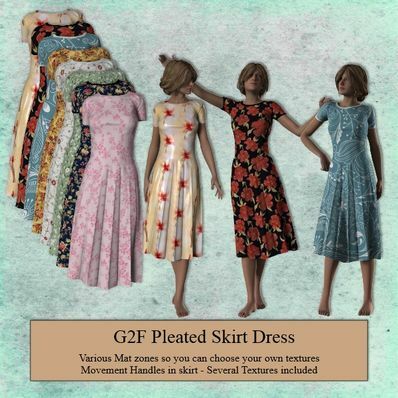 Pleated Skirt Dress for Genesis 2 Female for use in Daz Studio 4.6. I love this style. Thanks! I've always liked pleated skirt dresses. Great job on it, thank you! Thank you very much for another wonderful dress! Your clothes are amazing and some of the most useful items in my runtime. Thanks so much for you artistry and charity. Thanks muchly for this very pretty, colourful and elegant skirt dress. Thank you Will map, looks really beautiful. Great job as usual. Hey nice to hear from you from Daz. Take care. Very nice. One of your best pieces. Lovely dress! I like all the textures, but my fave is the blue one. Thanks! Thank you for this and *ALL* the wonderful models you create and share!